My friend Jim Earp has invited me to perform with him at Cosmos Coffee Café. 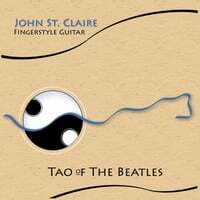 I will be playing some new fingerstyle pieces I have been working on as well as songs from my album Tao of the Beatles. I'll sneak in a piece on Native American flute accompanied by Jim. Jim is a super accomplished fingerstyle guitarist and has recorded over 8 CD's. He will be playing original slack key compositions from his latest album, Aloha Guitar, and a variety of his fingerstyle arrangements. from folk, funk, pop, soul, jazz and world influences. wrapped in an unforgettable evening of music that leaves the audience wanting more." This 2 hour workshop will be a sampler of Vicki's 5 Instructional Course offerings. instrument, a tuner, a capo, open ears, heart and mind! All levels welcome. Contact (760) 522-1695 for details. You can see a video sample from a Turkish television performance below. I will be performing at the San Diego Botanic Gardens from 2-3. We are happy to announce that Holly Shimizu will be our honored guest at this year’s Herb Festival. Since returning as Executive Director of the U.S. Botanic Garden in November 2000, Holly Shimizu has led the Washington D.C. Garden in many new and exciting directions. The Garden was accredited by the American Association of Museums in 2007 and has received numerous awards. In addition to many prestigious positions in horticulture, she served as Curator of the National Herb Garden at the U.S. National Arboretum. Holly will presenting at 1:00 pm both days. On Saturday she will be sharing how she started the National Herb Garden and on Sunday she will be discussing the “How to’s” of Growing herbs for Use and Beauty. In addition to Holly’s presentation, there will be on-going speakers on garden and herb-related topics, guided tours of the Herb Garden, Herb Festival Market-place, the A-Z on Herbs information booth, and the SDBG Spring Plant Sale with a multitude of vendors. Back by popular demand is Tomatomania!® with lectures on culture and care and plenty of tomato seedlings. As everyone who ever attended our monday night sound meditations with Tibetan bowls, gongs, Native American Flutes will attest it is an incredibly powerful and transformational experience. Many people report achieving the most relax state of their entire lives. This Monday the sounds will be combined with the special guidance of Wendy Hill. Wendy has practiced spiritual and psychological counseling for over 30 years in Encinitas. Wendy will guide the group toward mastering their thoughts and emotions. Wendy studied with both Milton Erickson, and Carl Rogers on how to transform self defeating core beliefs, target the root of any personal problem; transcend the critical analytical level of your mind; realign how you think, feel, act, and improve your life and your relationships. Wendy Hill, M.A., CCHT, and doctoral candidate (2013) is located in Encinitas, California and serves clients all across America and beyond. Please arrive by 6:45 to settle in, and bring blankets, pillows, and anything else that will help you feel comfortable. Please Note: Those who have purchased the Monday Night Sound Meditation Subscription no need to RSVP you space has already been reserved. All are welcome but space is limited. Please RSVP to reserve a space. I will be guiding a sound meditation at 4:00 pm at the HSGA Monthly Psychic fair. Come check out the event. There will be a lot to see and great times to experience. I will have the pleasure of accompanying this service which will be presided over by Rev. Uki MacIsaac MA, who is an internationally acclaimed speaker, intuitive counselor and ordained minister. To learn more about Rev. Uki visit her site by clicking this link. for an amazing, sold out response to our last event! ****Tibetan Bowls will be placed all throughout the space as John moves about creating "musical energy healing." WE MADE ALOT OF NEW FRIENDS ! SO FUN to be together. Last Monday evening sound meditation was about experiencing the sensation of the 12 chakras of the human energy field and how to connect your conscious mind with your unconscious mind and higher self by balancing the flow of energy in that field. Several people reported their deepest ever relaxation experience accompanied by a profound connection with the oneness of all that is. We'll be doing a similar meditation again on March 11th. This Monday, February 18th sound meditation will be an opportunity for everyone to experience the 7 layers of their aura, feel the color and understand the function of each layer, as well as develop practical wisdom gained by personal knowledge on the healing that takes place on each level. Please arrive by 6:45 so everyone can get settled in for us to begin at 7:00. I have new mats and just acquired some extra thick pads to make it softer and warmer for those laying on the floor. I'm starting a new subscription discount program for those who like to attend regularly. Instead of $20 per event, subscribers pay only $60 for the month and have a guaranteed space reserved for you. Basically, buy 3 and get one free. You can give your spot to another if you're unable to attend and as a subscriber, any first time guest you bring is only $10. There is a sound meditation every Monday at 7:00, with Tibetan bowls, gongs, bells, crystal bowls, rain sticks, and Native American flutes. There are usually 2 different guests invited each month to share their special healing modality accompanied by the sound meditation. Subscriptions can now be purchased by clicking here. Thanks for all your support and participation in these events. Last Monday Dr. Paul Davis was here and gave everyone a 3 minute osteopathic manipulation to align the reciprocal tension membrane of the dural sac that holds your cerebrospinal fluid. Once it was flowing for everyone, our meditation led us to use that living liquid crystal to expand our enlightenment throughout all our tissues and beyond. This Monday night I will be leading the group through a 12 Chakra meditation. Everyone will have an experience of the 7 Chakras within our body and 5 others that exist as a part of the torus of energy that surrounds our body. Trace left 23 of her extra large bowls here to add to the event and they've all been labeled, tuned and laid out in my home as if it's a giant xylophone. I have some beautiful new bowl harmonies planned, unlike any you may have experienced in the past. The sounds will guide your meditation to experience to a deep unconscious alignment in you energy field to optimize your health and well being. There are a limited number of spaces available so please purchase your tickets here. Bring a mat, blanket, pillow, or whatever helps you to be comfortable. There will be a dozen mats available here. Please note: If you have been rerouted to this page, unfortunately the event you are trying to purchase tickets for is sold out. Please purchase your ticket to a future event early to reserve your spot. Thank you to all who attended Monday night's sound meditation. Deborah Wayne was my guest healer and she created a memorable group healing experience for everyone. She'll be back again in about a month, so those of you who couldn't get a spot because it sold out, remember to buy your tickets early. Next week's guest healer for the weekly Monday night sound meditation, on Feb 4th, will be Dr. Paul Davis. He is an Osteopathic Physician who, for the past 14 years has Practiced Family Medicine at a Native American Clinic near Mt. Shasta. He is a clinical professor of Family medicine on faculty at several medical schools, had taught at the Osteopathic College and studied a variety of alternative energy healing techniques as well. He enjoys teaching and practicing Osteopathic Manipulation. Dr. Davis will discuss the fluid motion of the cerebrospinal fluid, atrial and venus, and lymphatic pathways and how Osteopathic Manipulation can affect these systems to help our bodies achieve optimal health. Sounds too technical? ... ha ha, you're in for a surprise, probably a few. He will talk a bit about how we are light beings, how light is transmitted through your body, and how your cerebrospinal fluid can behave like a liquid crystal, similar to the display on your electronic devices. During your sound meditation he will work on each person individually to assist you in realizing some of that inner light potential. "Humans are basically hairy bags of water. Balancing the fluids in the tissues is how Osteopaths awaken the body's self healing mechanisms." He is an extremely entertaining presenter and you may be healed by your laughter alone, as well as the sounds and his hands on techniques. Please arrive between 6:30-6:45 pm to allow time to settle in for the event to start promptly at 7:00 pm. Please bring a mat, pillow, blanket, and anything else you need to feel comfortable. Space is limited so you must purchase your tickets now to reserve your space. *Note: If you are redirected to the homepage of my site, unfortunately all of the tickets for this event have been sold out. Cardiff House Concerts is proud to feature Muriel Anderson for a night Great Music. Tibetan Bowl Healer, John St. Claire will accompany on Native American Flute and Tibetan Bowls. Tibetan Bowls will be placed all throughout the space as John moves about creating "musical energy healing"
As you are lying on the floor or furniture, the healing vibrations may be deeply felt in your physical body. as well as increasing your spiritual consciousness. AND SURE TO FILL UP QUICKLY! © 2019 John St. Claire. All Rights Reserved. Powered by HostBaby.